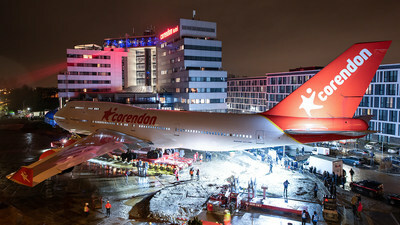 5D-experience about the 747 and the history of aviation later this year. a new final destination in the hotel garden after 30 years of reliable service. enough to carry the enormous weight. is partly an ecozone, open to hotel guests, and can be used as a festival site. kind of takes your breath away," he says. without whom the stunt could never have been successful. conventional types. It was also the first wide body aircraft, with two aisles. which was added to the fleet in 1989, was then baptized by nine Thai monks. decorates the Corendon hotel garden. constructed of approximately 2.100 metal road plates weighing 1.500 kilos each.